Birmingham Airport has unveiled long-term growth plans to challenge Heathrow’s supremacy and help to what they say will ‘rebalance the UK economy’. The plan would see Birmingham catering for 70m air passengers a year and 500,000 flights a year – both slightly more than Heathrow now. A business park for the Midland’s manufacturing sector is also proposed alongside the expanded airport site and has the backing of some business leaders and local councils. It, of course, predictably, promises huge numbers of jobs – no less than a quarter of a million. 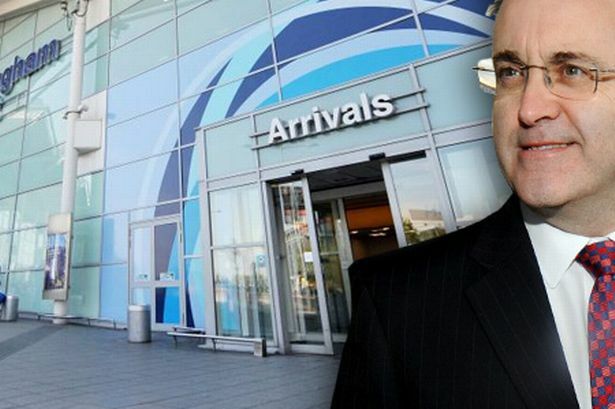 Paul Kehoe, the airport’s CEO, expects that in 20 years’ time British air travel will double – though there is no evidence for this, and it is utterly at variance with the advice of the UK’s Committee on Climate Change that UK air passengers could perhaps increase by 60% on 2005 levels by 2050. For the whole of the UK. Birmingham airport thinks transport infrastructure acts as an economic enabler, “a pathway to a virtuous cycle of growth”, and “each major regional economy cannot succeed without its own meaningful international gateway.” They believe “the UK economy is large enough to support at least four major ‘national’ airports – London, Midlands, North West, Scotland”. On 10th June 2013, Birmingham Airport launched its long-term vision for UK aviation. The vision shows how Birmingham Airport will be at the centre of a network of great airports delivering aviation capacity and connectivity to the great cities of Britain. The Airport’s development strategy will plug the greater Midlands economy into global wealth and enable businesses to reach the markets they need to deliver jobs and growth for future generations. Birmingham Airport’s proposal meets the Airports Commission’s criteria because it is not just about runways. It is about creating the infrastructure to support Birmingham, London and Manchester. Each region has its own economic identity and requires unique international connectivity to cater for those needs. Expansion at Birmingham Airport will make a substantial contribution to meeting growth in the UK’s air passenger demand in the long-term. It is cost effective, in line with UK climate change commitments and has been carefully designed to align with existing regional development and transport investment strategies. This consistency will maximise the social and economic value of major developments, such as the M42 gateway, HS2, and the Greater Birmingham project. The Airport will be submitting a full response to the Airports Commission on 19th July 2013. (the only comment on climate or carbon emissions in this pamphlet is to say that “it is line with UK climate change commitments”. Read Paul Kehoe’s, CEO Birmingham Airport, speech at the launch event here. Its vision, which has been formally endorsed by the Greater Birmingham and Solihull LEP, the Black Country LEP and the Birmingham Chamber of Commerce Group, supports growth of up to 70 million passengers each year and up to 500,000 air transport movements from an expanded facility. [Bearing in mind Birmingham airport had approximately 9 million passengers in 2010 – AW]. The airport’s plan supports the development of a business park for the Midlands manufacturing sector alongside the expanded site, and one of Europe’s biggest conference centres at the NEC. The airport’s long-term vision is a response to questions asked by the Airports Commission, which is examining the need for additional UK airport capacity and will recommend to government how this can be met in the short, medium and long-term. Paul Kehoe, CEO of Birmingham Airport, said great cities like Birmingham deserve great airports. A high proportion of the country’s potential demand for business air travel comes from the Midlands catchment area, which is home to half a million businesses, 6.5 million employees and specialises in high-value manufacturing sectors. The Airport’s vision is for London, Birmingham and Manchester to all have the great long-haul airports that they need to succeed, whilst at the same time providing flexibility and resilience for the UK aviation sector. The network proposal excludes expansion at Heathrow because that would expose too many people living in West London to unacceptable noise pollution. However, the network complements a new mega-hub in the South East or a more dispersed model. With central transport links, long-haul runway and spare capacity for 27 million passengers, Birmingham Airport has been arguing to the Commission that it can offer much-needed capacity in the short-term. This recent announcement gives Birmingham the ability to play its part in the long-term strategy too. Sir Albert Bore, leader of Birmingham City Council believes the vision will help bring trade and prosperity for Britain’s industrial base in the Midlands, just as Heathrow has helped the high-tech concentration along the ‘M4 corridor’ and helped support the global position of The City. Looking at Birmingham airport’s submission to the earlier Airports Commission discussion on making the best use of short term and medium term airport capacity (May 2013) at Response from Birmingham Airport I notice that – as usual – on page 5 they have given the greenhouse gas impacts of this an neatly only count the landing and takeoff emissions and not any part of the cruise emissions. I cannot understand how a rational person can include merely the take-off and landing cycle emissions, but not the rest of the flight, including the one and not the other ? In addition, they classify the aviation emissions as an indirect impact of expansion,not a direct one, as if they would pay all that money to make a bigger airport just for the privilege of driving their luggage trains round a bigger piece of concrete, and selling sunglasses to sightseers to the white elephant they had built? Of course, the purpose of the airport is to fly more passengers, and over long distances. As Birmingham airport says on the basis that “An important part of understanding howBirmingham Airport can reduce emissions is to measure what is currently emitted from our operations what gets measured gets managed”. ie. not a lot. Air travel is one of the very highest carbon-emitting activities known to man, especially if calculated on a per hour basis. markets without direct air links. · Over the next 20 years annual passenger numbers will increase by 220 million passengers and yet plans for an additional runway at Heathrow only offers additional capacity for 20 million passengers. Notes to editors:- 1. The Airport’s submission to the Commission has been formally endorsed by the Greater Birmingham and Solihull LEP, the Black Country LEP and the Birmingham Chamber of Commerce Group. 2. The launch document can be found at: http://changeopinion.com/wp-content/uploads/2013/06/WES_fast_leaflet_may2013_PRINT_single_pgs_small.pdf. The contents of this document are also embargoed until 0001 Monday 10th June. 3. The full press Q&A can be found at http://changeopinion.com/wp-content/uploads/2013/06/Press-QandA-full.pdf. This vision will form part of Birmingham Airport’s long-term response to the Airports Commission who will decide which proposals merit more detailed consideration. If the Airports Commission reaches a view in its interim report that a significant increase in aviation capacity is needed, the recommended options will be developed into more detailed schemes on which further public engagement will be sought. Posted: Monday, June 10th, 2013. Filed in News about Airports, Recent News.